Nan Talese at the 2009 Tribeca Film Festival. 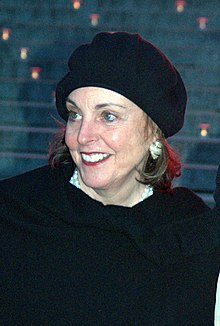 Nan Talese (née Ahearn; born December 19, 1933) is an American editor, and a veteran of the New York publishing industry. Talese is the Senior Vice President of Doubleday. Since 1990, Talese has been the Publisher and Editorial Director of her own imprint, Nan A. Talese/Doubleday, known for publishing notable authors such as Pat Conroy, Ian McEwan, and Peter Ackroyd. Nan Irene Ahearn Talese was born in 1933 to Thomas J. and Suzanne Ahearn of Rye, New York. Her father was a banker. Talese attended the Rye Country Day School and graduated from the Convent of the Sacred Heart in Greenwich, Connecticut. She was a debutante presented at the 1951 Westchester Cotillion. Talese graduated from Manhattanville College in 1955. Talese married Gay Talese in 1959 and at that time was already working for Random House. Talese began her career at Random House, first as a proofreader and later as the publisher's first female literary editor. She later worked at Simon & Schuster and Houghton Mifflin. Talese has edited many notable authors, including Pat Conroy, Margaret Atwood, Ian McEwan, Jennifer Egan, Antonia Fraser, Barry Unsworth, Valerie Martin, and Thomas Keneally. Talese's imprint also published James Frey's controversial memoir, A Million Little Pieces. In 2006, she published a small edition of mostly blank pages under the title of Useless America by Jim Crace, whose book The Pesthouse was forthcoming from her imprint but which did not yet have a title. Useless America was inspired by a "phantom" book of Crace's which had been listed on Amazon in error. The title came from the line "This used to be America", which Crace had planned to use to begin Pesthouse. The scarce book now commands a high resale value. In 1959, Talese married writer Gay Talese. Her husband has been working on a book since 2007 that documents their relationship. They have two daughters: Pamela Talese, a painter, and Catherine Talese, a photographer and photo editor. ^ Smilgis, Martha (April 14, 1980). "Gay Talese's New Sexpose Leaves Him $4 Million Richer—and, Somehow, Still Married". People. New York City: Meredith Corporation. Retrieved January 8, 2013. ^ a b c d "Gay Talese Marries Miss Nan I. Ahearn". The New York Times. New York City: New York Times Corporation. June 12, 1959. Retrieved April 9, 2016 – via timesmachine.nytimes.com. ^ Welsh, James M. (2010). The Francis Ford Coppola Encyclopedia. Lanham, Maryland: Scarecrow Press. p. 246. ISBN 978-0810876507. Retrieved April 4, 2015 – via Google Books. ^ a b "Oprah vs. James Frey: The Sequel". TIME. July 30, 2007. Retrieved September 11, 2009. ^ Celia McGee (December 1, 2010). "Once an Editor, Now the Subject". The New York Times. Retrieved March 25, 2012. ^ "Nan A. Talese | Knopf Doubleday". Knopf Doubleday. Retrieved 2017-12-03. ^ a b "A Nonfiction Marriage". New York. April 26, 2009. Retrieved September 11, 2009. ^ Peretz, Evgenia (April 2017). "How Nan Talese Blazed Her Pioneering Path through the Publishing Boys' Club". Vanity Fair. Condé Nast. Retrieved 2 May 2017. ^ "Perkins Award Winners". Center for Fiction. ^ Ulin, David L. (May 24, 2007). "Jacket Copy: Useless America". Los Angeles Times. Los Angeles, California: Tronc. Retrieved 2 May 2017. ^ "Talese's memoir details his writing travails". Seattle Post-Intelligencer. May 16, 2006. Retrieved September 11, 2009. ^ Jonathan Van Meter (May 4, 2009). "A Nonfiction Marriage". New York Magazine. Retrieved March 25, 2012. Wikimedia Commons has media related to Nan Talese. This page was last edited on 3 November 2018, at 21:30 (UTC).